Warner Brothers released on Youtube the trailer for Guilliermo del Toro's Pacific Rim last week, and critics could only talk about one thing: Portal. The voice of Ellen McLain, appears in the trailer for about 10 seconds, as an artificial intelligence program. "Initiating launch operations. Gypsy danger. Pilots ready to connect. Two pilots engaged in neural bridge." 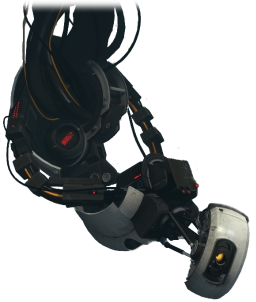 However her voice is not any ordinary voice, as they have modified her voice exactly as it's used in Portal and Portal 2. She sounds so similar to her GLaDOS incarnation, that many fans were at first wondering if the movie would be a Portal movie. And while it's not, for fans it just may be the next best thing. Portal is perhaps one of the most beloved video game franchises in the world among nerds, with thousands of nerds bringing references such as "The cake is a lie," to anime conventions around the country. Including references to such a staple of nerd culture in what promises to be one of Hollywood's biggest blockbuster robot movies helps tie nerd culture to the rest of the world. And fans who want to meet Ellen McLain in person, either from her appearance in Pacific Rim or in Portal and Portal 2 now have the chance to do so, in Chicago. Anime Midwest is a three-day geeky convention happening July 5-7, 2013 in Chicago, and Ellen will be appearing for all three days, performing songs from Portal as part of the convention. As Portal games have only been released twice, Pacific Rim will give fans another chance to enjoy the nostalgia of GLaDOS as Ellen appears in more of popular culture.